Francoise Abanda and Katherine Sebov will compete in the main draw of the $100,000 ITF Pro Circuit event at Hollyburn. Organizers of the Odlum Brown VanOpen are pleased to announce that two of Canada’s up and coming rising stars have been awarded wild cards into the women’s draw for this year’s tournament. In addition to Gabriela Dabrowski and Rebecca Marino who were previously announced, 21- year-old Francoise Abanda and 19-year-old Katherine Sebov will compete in the main draw at Hollyburn. “We are thrilled with the addition of Francoise and Katherine to our tournament. To see young Canadian players get an opportunity to compete with some of the world’s best on home soil is fantastic. Playing Canadian events like the Odlum Brown VanOpen is the best way to help develop top players in our country,” said Tournament Director Rik de Voest. 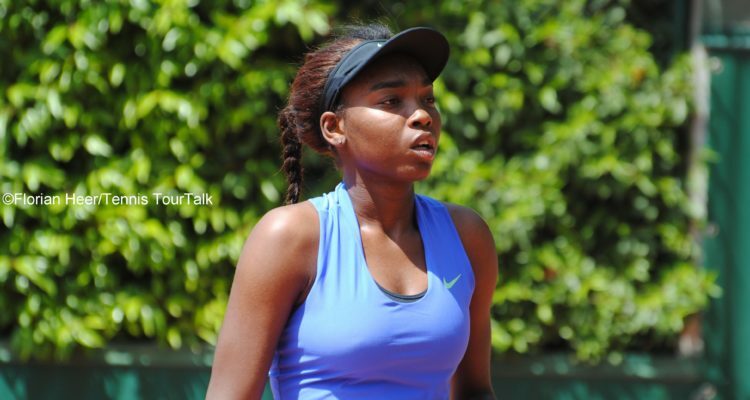 Abanda is currently the third highest ranked women’s player in Canada, behind Eugenie Bouchard and Carol Zhao. The 21-year-old reached the second round at both the French Open and Wimbledon last year and has been ranked as high as World No. 111. The Montreal resident notched her first Top 50 win of her career in the second round of this month’s Coupe Rogers against Kirsten Flipkens. Sebov has an impressive two career wins over players ranked in the Top 100, former World No. 19 Varvara Lepchenko and former World No. 73 Veronica Cepede Royg. The 19-year-old from Toronto also reached the finals of the $60,000 Granby event last year and the $25,000 Toyota event this past March. This entry was posted in ITF World Tennis Tour, ITF World Tennis Tour News and tagged Francoise Abanda, ITF Pro Circuit, Odlum Brown VanOpen.